This topic contains 541 replies, has 24 voices, and was last updated by Doobie 21 hours, 8 minutes ago. well well well I got a box from Bosch today. It’s the GLM20 laser measure and the GMS120 wall scanner. Thank you Bosch and Brittany! That’s awesome, congrats! I have the GLM20 and love it, you’ll have to let us know how the wall scanner works – I have developed a deep distrust of any stud finder type devices, but I’ve been curious about Bosch’s. Awesome ! Glad to see the boxes flowing again. Congrats and enjoy your new tools. That’s great! Congrats on your new Bosch tools. Congrats on the box Miamicuse. 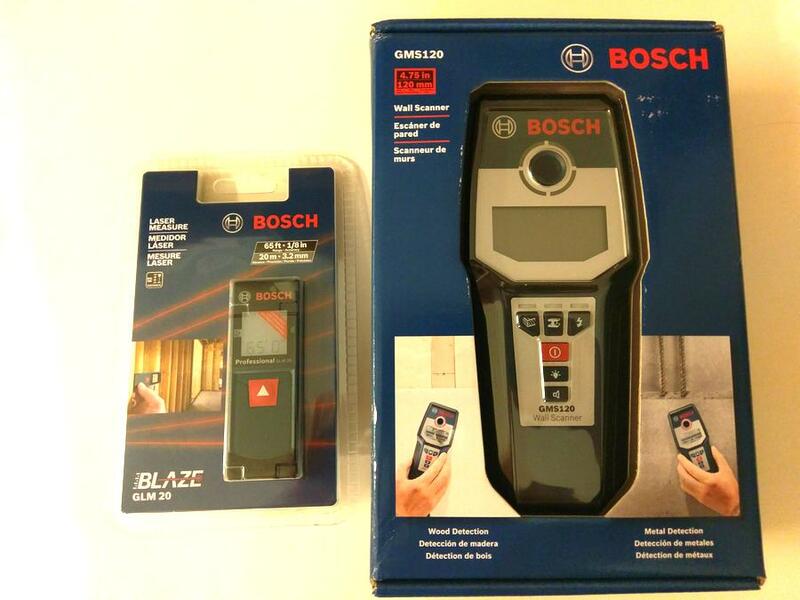 Congrats, I have both of them , I actually gave the laser measure to a friend , it takes a few times to get used to the wall scanner , but after getting used to it it’s actually pretty good. Congrats on getting a box. Those look like great tools to have! Same here. I have a few wall scanners and don’t really use them much. In my case it is because down here I deal with thick plastered walls that’s over an inch sometimes two inches thick all the time. Most times I am trying to locate wood studs and it’s hit n miss. So I decided to try this one from Bosch and see if it could make a difference. Did the laser measure not do what you want? I intend to use it as a quick rough measure too outdoors. Like how far from where I am standing to the wall, to the fence etc…and it’s super compact. However can’t do horizontal measures like table dimensions unless you put something to intercept. One quick question if someone knows…these laser do they go through water? If I am standing at a dock, and point it down, am I measuring the distance to water level or distance beyond it? Does it depends on whether water is clear or murky? not sure if the laser works in water, something tells me no because the beam will get broken up. Sounds like a fun science experiment – anyone have a bucket they want to fill with water and test it out? I’d try with calm and disturbed water to see if it makes any difference. I’d assume murky would be the same as a solid surface, but maybe that’s something to check too – there’s bound to be some sort of threshold if it works fine in clear water, some number of parts per million of dirt that make it opaque to the laser. I just finished giving it a try , it’s our rinse agent so it’s just water with Cascade dishwasher soap. Well there you go – so I guess it probably wouldn’t be great for anything in a lake or bay either. Right on, on the box Miamicuse. Boy does that look nice. I bet your happy to use that soon. Congrats.